A funny little fact that you might not know about me is that I was a traveling wedding hair dresser for 12 years before I started this blog. I love wedding hair and it was my favorite to work on behind the chair. So today I’m sharing my professional hair tips with you on wearing a gorgeous chignon, or low bun for your wedding day hair style! The word chignon (pronounced shin-yon) comes from the French meaning ‘nape of the neck’, which in this case refers to a small bun worn low on the neck. This style truly makes every woman look glamorous and if you’ve never had your hair professionally styled this way, you definitely need to try it. If not for your wedding then maybe for your bridal shower or morning after brunch! Every type of hair wears the chignon well, except for ultra short styles. As long as your hair is just about touching your shoulders (or longer of course) it can be sculpted into this beautifully classic shape. Find a few of your favorite chignon images online to take to your hair dresser for your trail run and think about these points below too. Ask your hair dresser what they think and if you’ll need any additional elements to achieve the exact look you want. Fine: If you have fine hair you’ll want to use a bun foundation to add the volume that makes this style so lovely. Medium: If your hair is of a medium thickness, you’re golden. Thick: If you have thick hair, just like every other “up-do” you’ll want to use a heavy duty bobby pins like spin pins to ensure your style doesn’t fall out. As you can see from the images above, all shades of hair color looks amazing in this style. Something to keep in mind is that your ends will be hidden within the bun. I myself have a fairly progressive ombré and so in this style – the blondest parts of my hair would be hidden. If you have an ombré, you might want to think about bringing the color up just a bit if your favorite shade happens to be on the ends, just something to think about. 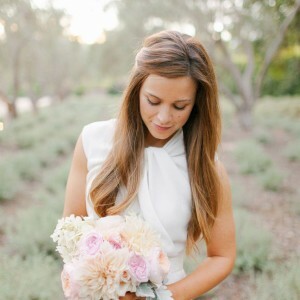 I’m pretty sure that every bride who colors her hair will be having it freshly colored before the big day, so as long as you do that – it will look amazing no matter what the shade! When it comes to wearing your hair lower on your neck, in a highly sculpted style – it’s best if your dress doesn’t touch your hair. Hair rubbing/touching fabric (especially sequins) is a sure way to make frizz, which will ruin your style. A low back, boat neck, sweetheart, or spaghetti strap will offer you the most room on your back and neck to dance, laugh, scrunch your shoulders, look left and right, look all the way up, etc. without snagging your style on your top. With this style, veils are typically worn either right on top of the bun, on the crown or not at all. Keep in mind that when you remove your veil from a style like this, you will need someone to touch it up and make sure it looks it’s best. 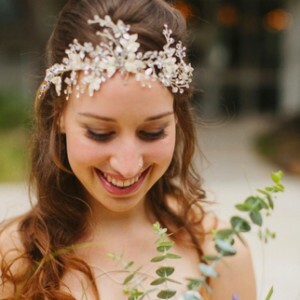 It’s popular to replace a veil with a hair piece or comb, which is a fabulous way to add a little something special to your reception style!